Texas (traditional count) pulled out a win, stopping North Carolina from having a 'three-peat', while Wyoming (per capita) took the magic CoCoRaHS Cup from North Dakota. This year's March Madness campaign was a huge success, with almost 1,200 new observers registering during the month. While Florida didn't take home any virtual trophies this year, I am happy that new observers signed up in some of the areas that were under-represented. Besides, there's always next year! Every year, March seems to be a busy month for me. 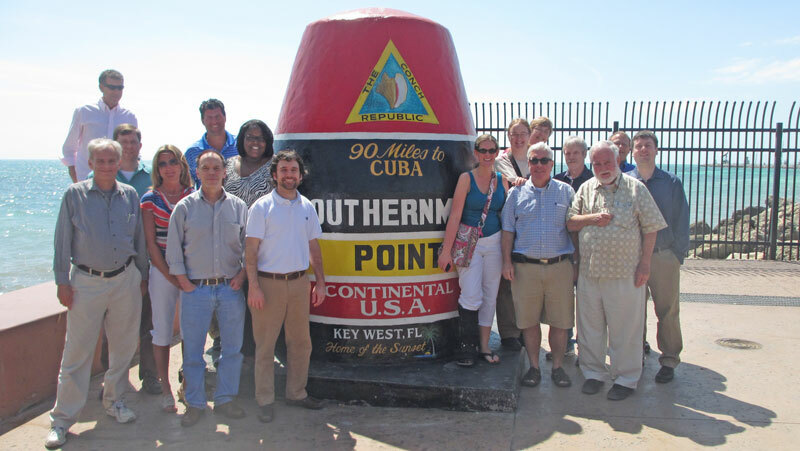 I was lucky enough to host a meeting for the climatologists in the Southeast U.S in Key West at the beginning of the month. I promised them nice warm weather... what we got was nice cool weather. Unseasonably cool weather. During our 3-day conference in the Keys, Key West tied its low maximum temperature record on the 7th of 65˚F that was set back in 1966. The average highs for Key West should have been around the mid 70's. That was still warmer than the temperatures that everyone else had been experiencing but a bit chilly for me. As March continued, poor Punxsutawney Phil had a bounty put on his head and was even looking at a lawsuit against his busted forecast of an early spring. If you thought March was colder than this past winter; you were correct! All of the major reporting stations in the state had monthly average temperatures that ranged between 3.5˚F and 6˚F below normal and were colder than December, January and February combined. This March was also a complete flip-flop from last March, when temperatures were 3˚F to 8˚F above normal. This old idiom has been spoken for generations, though for the last few years, March has come in like a lamb and gone out like a lion. From March 23rd to 25th, 103 of the 129 severe weather reports were recorded. A low pressure system in Louisiana set up an interesting weather event as a warm front lifted through the Panhandle on the 23rd and 24th, spawning one round of severe weather. Then, a second round of severe weather hit the state as the cold front pushed through on the 24th and 25th. 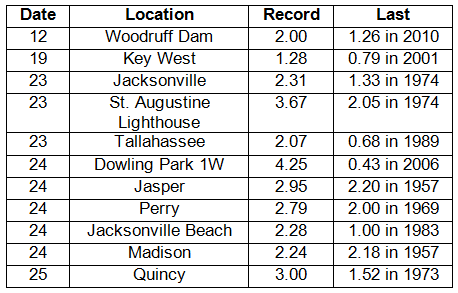 On the morning of the 23rd, numerous hail reports came in from locations along the Florida Panhandle and Big Bend, including Panama City Beach, Wewahitcha, Altha, Chattahoochee, and Wakulla Springs. Hail sizes ranged from dime (0.75") to quarter (1.00") at these locations. One particularly strong thunderstorm moved east along and parallel to I-10 from Tallahassee toward Jacksonville and triggered multiple reports of hail and storm damage. An Emergency Manager in Bradford County received reports of baseball-sized hail (2.75") near Lawtey, FL. In addition to the hail and winds, an observer in Lake City reported that over 2.00" of rain had fallen in a 30-minute time period as this storm moved through the area. The same severe thunderstorm caused heavy rains, storm damage and more hail reports as it moved into the town of St. Augustine. Later on the 23rd, lightning caused a house fire in Milton, and storm total rainfall amounts over 2.50" were reported by observers in and around Jacksonville. The 24th saw more reports of storm damage and high winds across much of the Panhandle, Big Bend and northern peninsula of the state. A measured wind gust of 75 mph was taken from the Orlando International Airport, and a gust of 86 mph was measured in the Lake Buena Vista area. Dime to quarter sized hail was reported across the central part of the state from Tampa to Orlando to Titusville. Trees were uprooted and numerous homes sustained damage as the cold front pushed through the area. Rainfall totals across the state varied in March (Table 2), though most of the state reported totals that were below normal. 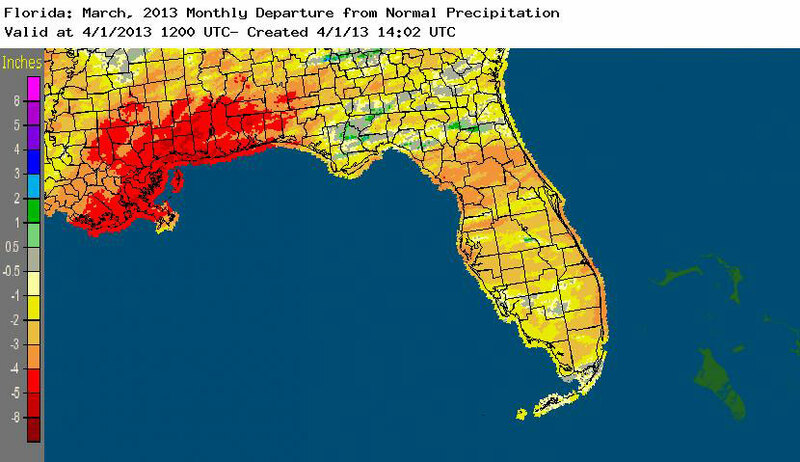 Localized portions of the northeast Florida and Big Bend regions recorded above normal rainfall (+1-2"), while the peninsula and Panhandle had 2 to 5 inches below normal precipitation (Figure 1). March 2013 was the 5th driest on record at Pensacola, and there were only 35 precipitation records broken in March - 11 of those records for totals under an inch (Table 3). There are still drought concerns as the 3-month outlooks predict below normal rainfall for the spring dry season. Table 1: March precipitation totals and departures from normal (inches) for select cities. Table 2. 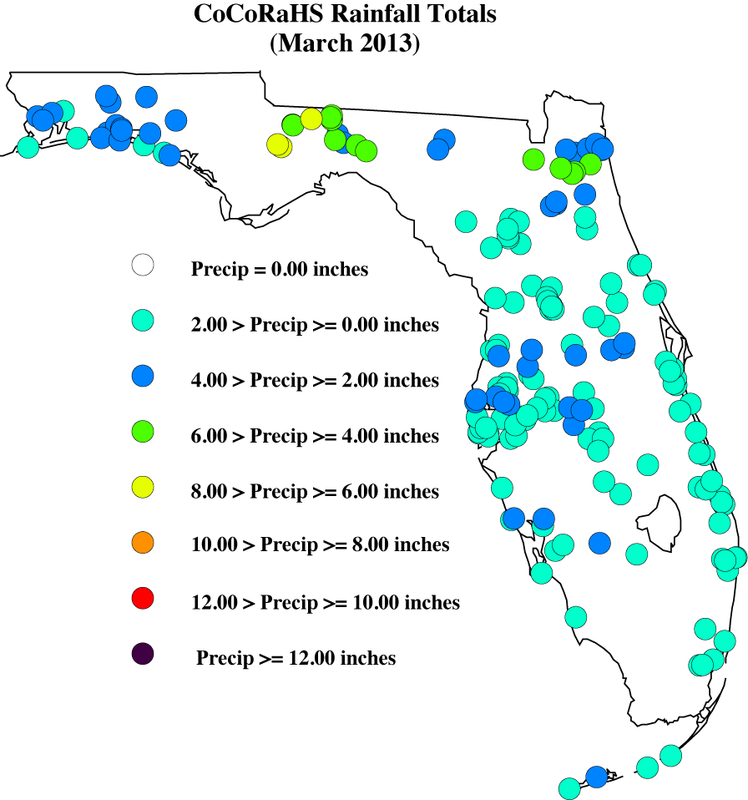 Select daily rainfall records (inches) broken during March (Compiled from NOAA, NWS). Here are the CoCoRaHS rainfall totals for March from some select CoCoRaHS stations across the state. While the statewide rainfall totals varied greatly across the state during March, most of the state saw below normal rainfall during the month. Since the release of the drought monitor on February 26th, the Panhandle has remained drought free, while the Peninsula and north Florida have continued to be plagued by dryness. The areas of moderate drought have expanded to cover about 48% of the state, including much of central Florida and portions of Broward, Collier, Dade, and Monroe counties. 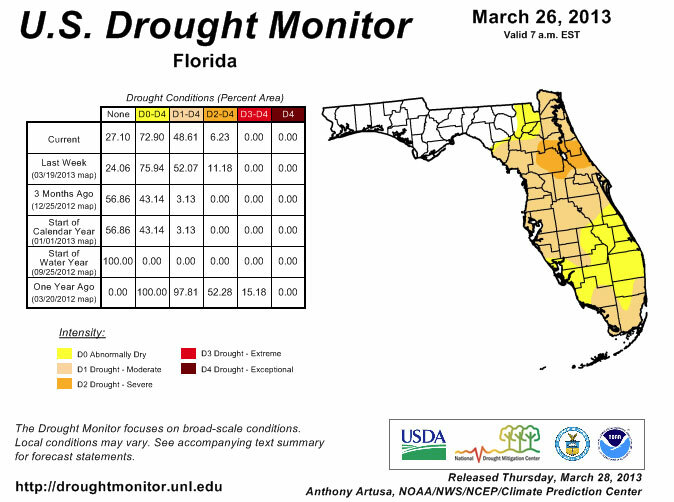 The area of severe drought in northern Florida has eased due to the heavy rains at the end of March, now only reported in Flagler, Lake, Marion, Putnam, and Volusia counties. Now that the state has officially entered spring, the normal rainfall during the months of April and May are some of the lowest for the year at many locations. The CPC has predicted that the three-month rainfall amounts for April, May and June will be below these normal values, which could put the state at a greater risk of a worsening drought. A few reports in Florida were flagged and required some additional information during March. I appreciate how understanding the contacted observers were, along with how quick they were to reply to my emails, though there are a few outstanding issues that need to be resolved. Please remember: if you receive an email from me with the subject line 'Question About Your Recent CoCoRaHS Observation', please take a moment to answer me back. And if you have any questions, please feel free to contact me.